Well, where should I start? I've lived in San Francisco for more than a decade, usually with at least one cat. I won the school spelling bee when I was in 7th grade; the word that clinched it was 'ukulele.' I originally set out to be a rock star when I grew up (I had a Bono fixation, but who didn't? ), and I have the guitars and the questionable wardrobe stuffed in the back of my closet to prove it. But most of us, I think, tend to take for granted the things that come easily to us. I loved writing and all indications were that I was pretty good at it, but I, thank you very much, wanted to be a rock star. Which turned out to be ever-so-slightly harder to do than writing. A lot more equipment was involved, that's for sure. Heavy things, with knobs. It also involved late nights, fetid, graffiti-sprayed practice rooms, gorgeous flakey boys, bizarre gigs, in-fightingwhat's not to love? But my dream of being a published writer never faded. When the charm (ahem) of playing to four people in a tiny club at midnight on a Wednesday finally wore thin, however, I realized I could incorporate all the best things about being in a band  namely, drama, passion, and men with unruly hair  into novels, while at the same time indulging my love of history and research. 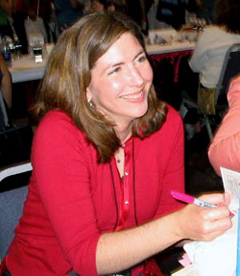 So I wrote The Runaway Duke, sent it to a literary agent (see the story here), who sold it to Warner Books a few months after that...which made 2003 one of the most extraordinary, head-spinning years I've ever had. I'm now with Avon books, and I've just launched my new Pennyroyal Green historical romance series. And why Regency Historicals? Well, for starters, I think we can blame Jane Austen. Her inimitable wit, compassion and vision brought the Regency vividly to life for generations of readers. If Jane Austen had written romances about Incas, for instance, I think, we'd have racks and racks of Inca romances in bookstores all over the country. But I'm a history FREAK, in general. I read more history, to be perfectly honest, than fiction (when I have time to read!) these days. When we were little, my sister and I used to play "Little House on the Prairie"we religiously adhered to the "schedule" outlined in the books, making mud pies on baking day and pretending to milk our long-suffering malamute, Shadow, when it was time to milk the cows. If you've made it this far and you're dying to know more JAL trivia, in this section you can visit the Julie Answers Questions About Julie page to read some decidedly unique FAQs and check out a few interviews with me, find out where to meet me, or peruse my truly random photo gallery. I found these various motley photos when I was cleaning out my desk drawer, and I decided to let them tell a little bit of the story of my life. I'm not sure whether you can see the blissed-out expression on my face clearly, but that horse I'm hanging on to might as well have been The Black Stallion for how ecstatic I was to be anywhere near a horse. His name was Apache, and he was a cranky old gray-and-red gelding assigned to me at horseback riding camp when I was 9 years old. We had a love/hate relationship, which may have begun when I tried to share a piece of my peanut-butter-and-jelly sandwich with him  it accidentally fell into one of his gigantic nostrils instead of his mouth. My attempt to retrieve it made us both a little frantic. He bit me once, and stepped on my canteen another time, leaving a perfect horsehoe-shaped imprint in it. He and another horse at the camp named Sultana inexplicably loathed each other, and whenever we went on trail rides they sought each other out and picked fights involving much embarrassing nipping and snorting. 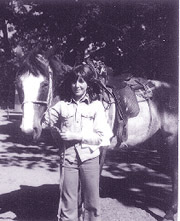 I got even with Apache, though: right before our "show" on the last day of camp (we rode around barrels in a circle, etc. ), I decorated his mane and tale with bright orange yarn ties. He looked very pretty. This photo is a perfect example of why few "good" photos of me exist: whenever a camera is turned on me, for some reason I seem to feel compelled to make a face or do a high kick, or both. 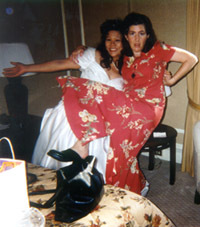 That's me and my friend Lisa (who always manages to look lovely in photographs) right before her wedding a few years ago. Dear God! Look at that hair!! It's like an entity!! 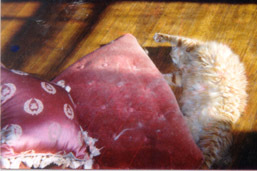 This is my cat Domenic (his face is at the top of the photo), who, contrary to appearances, did not fling himself off the chair; he's just sleeping on his back in the sun. 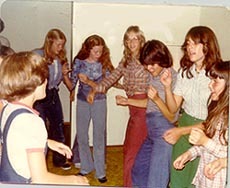 I think this was my 7th grade birthday party. I love how we all look so earnest, like the fate of the world depends on how well we dance to this particular song. I can't remember what the song was; given that we're all more or less in Hustle formation, I'm guessing it was something by KC & the Sunshine band. That's me in the green Dittos; my sister Karen is in the right hand corner next to me. And clockwise from the left front is Marla, Patty, Cindy, Dana, and Leona.